The much-needed Outer Ring Road (bypass) for the city, being awaited by the denizens since 2006, is still far away from becoming a reality. Despite the project being taken up by the Gammon Infrastructure Projects in 2014 after a long delay, none of the works related to it has materialised. About two and a half years later, the NHAI Vijayawada Unit sent the contract termination proposal to the Union government owing to the procrastination by the contractor. 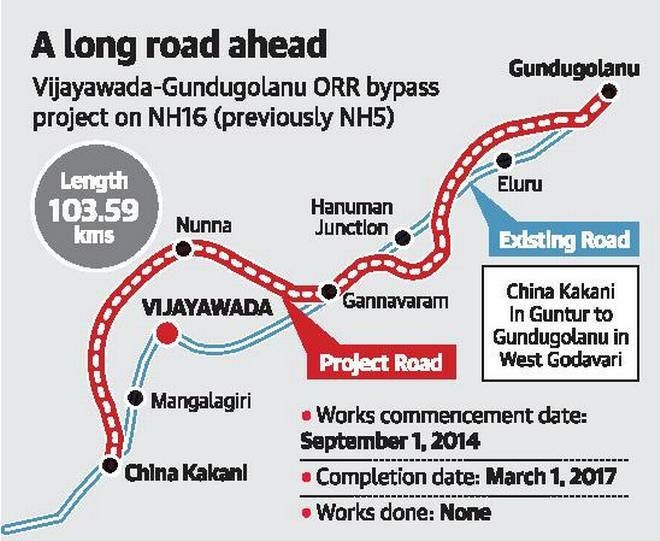 The 104-km ORR from China Kakani in Guntur district to Gundugolanu in West Godavari via the city’s surrounding villages Gollapudi, Nunna, Gannavaram and Hanuman Junction commenced in September 2014. As per the given 912 days of the construction period, the part six-lane and part four-lane was supposed to have been finished by the end of February. Now, the NHAI is yet to decide on the termination of the project due to the default of the contractor and further orders regarding the project are awaited. However, there is speculation that the project might be scrapped as the State government has brought to the fore the CRDA outer ring road after the announcement of the capital region. The 210-km ORR will cover Guntur city and a large portion of the Krishna district. When contacted, Project Director of Project Implementation Unit, Vijayawada, M. Vidyasagar said the termination proposal had been sent to the NHAI long ago and the response was awaited. “Once the termination is cleared, fresh tenders would be called in a month’s time and it may take about six months for the project to take off,” Mr. Vidyasagar told The Hindu. Meanwhile, the civil society is upset over the delay in the execution of the project. The Amaravati Abhivrudhi Sangham members and former MLA K. Subba Raju alleged that the delay amounted to criminal negligence. Completion of the project would help the city get rid of traffic on NH16 and NH65 which passes through it. Also a bridge of 3.14-km length will be built across the Krishna near Gollapudi. Tenders of Videography Work in..
cotton waste tender in Vadodar..
Innovas Business will work very closely with your company and will get to know all of your strengths, experience and expertise. As well as helping you to write your and tender, we can also help your business become more tender. SAMPLAST®-SC is a ready to use admixture formulated to achieve the highest performance level and durability of concrete meeting quality standard that prevailed in the international market as a high range water reducing admixture. It greatly improves the effectiveness of cement dispersion requiring less water for mixing and obtain concrete workability. Rust Remover Supplier in Ahmed..